Chief Minister Virbhadra Singh today listened to the public grievances in the Mini Secretariat on his first day of winter sojourn in Kangra district. Various delegations and individual’s in large numbers met the Chief Minister to share their grievances. Most of the in grievances were resolved on the spot while few cases were handed over to the concerned authorities for speedy disposal. A delegation of Home-Science students from CSKHPKV, Palampur urged the Chief Minister for creating more employment avenues in Government and private sectors in the State. A delegation of Punjabi Teacher’s Association (H.P.) from Una district apprised that they were getting honorarium on period basis and requested for ensuring them full honorarium. Delegations of Urdu Teachers, Home Guards, B.D.C. Chairman Members Body, IT Outsourcing Employees Union and other organizations also met the Chief Minister. The Chief Minister assured all the delegations that their genuine demands would be dealt sympathetically. 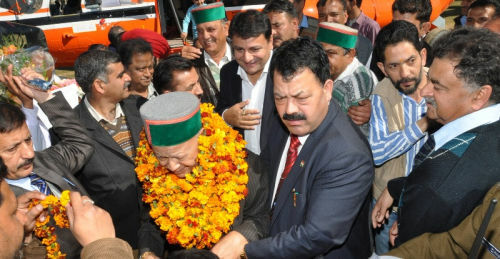 Earlier, he was given rousing welcome by the local people, leaders and the District Administration. Urban Development and Town and Country Planning Minister and local MLA Sudhir Sharma and Kewal Singh Pathania, Vice-Chairman, HRTC, who accompanied the Chief Minister from Shimla, Sanjay Rattan, Yadwinder Goma and Pawan Kajal, MLAs and Deputy Commissioner. C. Palrasu, and other senior officer’s were also present on the occasion. People in large number from various parts of the district had assembled in large number at various places to greet the Chief Minister since morning.